Small volumes of anti-ACP1 antibody vial(s) may occasionally become entrapped in the seal of the product vial during shipment and storage. If necessary, briefly centrifuge the vial on a tabletop centrifuge to dislodge any liquid in the container`s cap. Certain products may require to ship with dry ice and additional dry ice fee may apply. Western blot analysis of extracts of various cell lines, using ACP1 antibody at 1:1000 dilution. 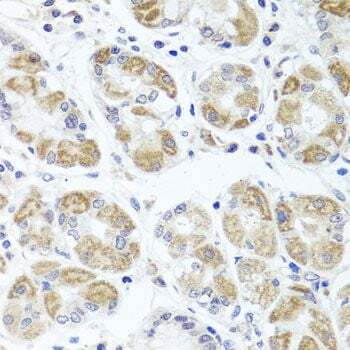 Immunohistochemistry of paraffin-embedded human stomach using ACP1 antibody at dilution of 1:100 (40x lens). 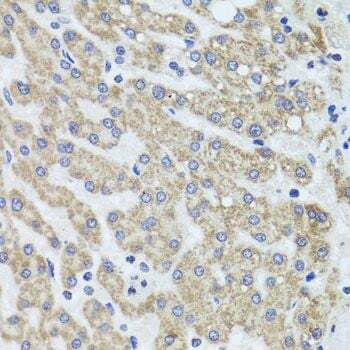 Immunohistochemistry of paraffin-embedded human liver injury using ACP1 antibody at dilution of 1:100 (40x lens). NCBI/Uniprot data below describe general gene information for ACP1. It may not necessarily be applicable to this product. 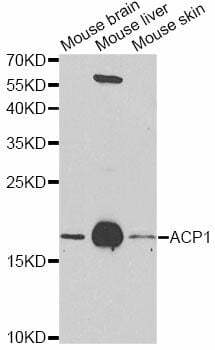 ACP1: a phosphotyrosine protein phosphatase. Functions as an acid phosphatase and a protein tyrosine phosphatase by hydrolyzing protein tyrosine phosphate to protein tyrosine and orthophosphate. Hydrolyzes orthophosphoric monoesters to alcohol and orthophosphate. Genetically polymorphic with three common alleles segregating at the corresponding locus give rise to six phenotypes. Each allele appears to encode at least two electrophoretically different isozymes, Bf and Bs, which are produced in allele-specific ratios. Three transcript variants encoding distinct isoforms have been identified for this gene. 1. ACP1 polymorphism is associated with type 1 diabetes mellitus.